The glamour and style of Hollywood’s Golden Age fused with modern West Coast living. Named after Marilyn Monroe, this suite offers a loft-like, open floor plan with white furniture, sleek hardwood floors, vintage Eames pieces, and a wrap-around balcony overlooking the Tropicana Pool & Café. 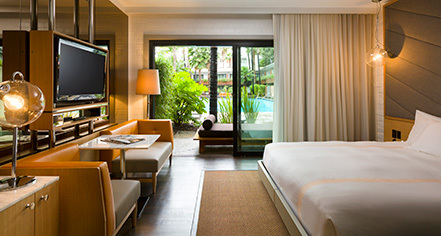 The 750 square foot Cabana Suite sports a private balcony overlooking the Tropicana Pool & Café or a patio with direct access to the pool. Rest easy in a king-size bed, lounge in a separate parlor with hardwood flooring, and indulge in a custom marble mosaic bath with a rain shower. Steps from the famed David Hockney pool, this 350 square foot room features mid-century furniture and a simple palette of natural oak and charcoal against bronze mirrors and ebony floors. With a view above it all, this 350 square foot balcony room features mid-century furniture and a simple palette of natural oak and charcoal against bronze mirrors and ebony floors, and overlooks the David Hockney pool at the Tropicana Pool & Café. 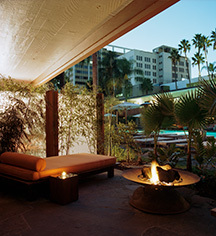 Steps from the renowned David Hockney pool, the 350 square foot Cabana Superior features mid-century furniture and a simple palette of natural oak and charcoal against bronze mirrors and ebony floors.